The scene at York as El Astronaute wins the Dante day opener for John Quinn and Jason Hart. JOHN QUINN is tempted to reach for the stars after El Astronaute’s trailblazing tactics paid off at York. Jason Hart’s mount flew out of the starting stalls in the Betfred Supports Jack Berry House Handicap – the opening race on Dante day. Frankie Dettori performs a flying dismount after Coronet won the Middleton Stakes. Third at Chester last week, El Astronaute was soon clear on the far side of the track before his rivals had found top gear. Dark Shot drew alongside entering the final furlong, while Major Jumbo and Carlton Frankie both threw down strong challenges nearer the stands side. However, El Astronaute passed the post a neck to the good, with Malton-based Quinn contemplating a tilt at Prix de l’Abbaye – one of Europe’s top sprints – at Longchamp in early October. “He deserved that, he was beaten by the draw at Chester last week. I thought his chance of winning might have gone, as you don’t get many, but he’s very game,” said the popular trainer. I Am a Dreamer wins for PJ McDonald and Mark Johnston. Quinn added: “I thought at the start of the season that if there was a little bit of improvement in him, and it looks like there has been, then he might be one for the Abbaye. While locally-trained winners do always have a special resonance at York because of the class and competitiveness of the racing, Knavesmire’s faithful have taken Frankie Dettori to their hearts over the years. And Dettori did not disappoint – the charismatic rider performed his trademark flying dismount with gusto after Coronet made a successful reappearance with a dominant display in the Middleton Stakes. John Gosden’s filly won the Ribblesdale Stakes at Royal Ascot last summer and ran several fine races in defeat, most notably chasing home esteemed stablemate Enable in the Yorkshire Oaks last August. Dettori cut a confident figure in the saddle throughout this 10-furlong Group Two and committed for home over two furlongs out. Dettori said: “She’s the best ride. Royal Ascot could also be on the cards for Main Desire, who kept her unbeaten record intact with a narrow success in the Westow Stakes under North Yorkshire jockey Danny Tudhope. Michael Bell’s filly won each of her two starts last season, but had not been seen in competitive action since landing a course and distance success in the Marygate Stakes at this meeting a year ago. The sprinter’s win provided some consolation to Bell after his Ascot Gold Cup hero Big Orange was ruled out for the season. “She’s very quick and that’s a great result given she’s been off the track for a year,” said the trainer’s son Nick. There was another Yorkshire success when I Am A Dreamer took the maiden for Middleham trainer Mark Johnson and jockey PJ McDonald. The only horse in the race with previous experience, he jinked right and then left when coming under pressure, but appears an exciting prospect. 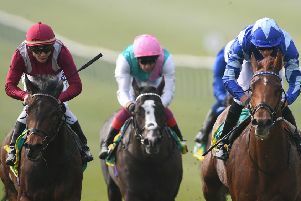 Johnston said: “He won by half a length, but PJ said if he stayed straight he’d have won by further. There was further White Rose success in the finale when Waiting For Richie prevailed for Tadcaster trainer Tom Tate and jockey James Sullivan. William Haggas hopes to run Tasleet in the Greenlands Stakes on Saturday week after being forced to miss Wednesday’s Duke of York Stakes. The 2017 victor suffered a knock just 24 hours before this year’s renewal, which was won emphatically by Harry Angel.